IT’s an odd thing to have a writing award given in your name, especially when you’re not dead yet. But clearly, not being dead has its rewards. The pay-off is being here to see young people exercising their hearts and minds for the pleasure and excitement of simply being allowed to do so. And if being the patron of such a prize is premature then I’ll just have to endure it as another form of being a little early and a bit awkward, as is my lifelong habit. Hatched is a collection of stories taken from the twenty years of the Tim Winton Award for Young Writers. The annual Award, auspiced by the City of Subiaco in Perth, is open to all Western Australian school children from five years old to age eighteen years old. This anthology features work from the first 20 years of the Award. Each story is accompanied by the category it was entered in and the school at which the author studied. Stories range from the real to the fantastical and explore a range of themes. Generational feuds, friendships, bullies, obsessions, the future all get an outing. Writers featured range from mid-primary to upper-secondary. 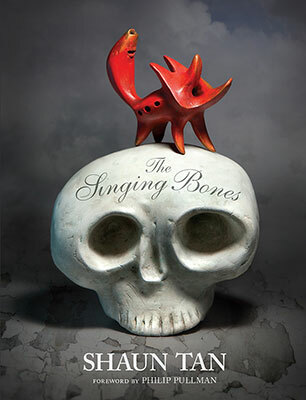 The collection includes a forward by Tim Winton and cover image by Shaun Tan. There are not many opportunities for young writers to practise their craft beyond school boundaries. Or to read the work of other young writers. The Tim Winton Award for Young Writers offers both. Young writers can see their work in print and also read works by their peers. It also allows the wider community access to the stories and the concerns of young writers. This anthology is testament to the imagination and skills of our young writers as well as to their families and teachers. It will be useful in schools and libraries to inspire other young writers. Beyond that, it’s an entertaining and fascinating read. Recommended for mid-primary to upper-secondary schoolers and beyond. This whimsical small format offering from the brilliant Shaun Tan is an absolute delight. The exchange student who comes to live with a human family is a tiny pointed headed character reminiscent of a leaf. The family have trouble understanding him, but share their life with him and make sure he has all sorts of experiences. They are never quite sure whether he enjoys them or not, but when he leaves, the family discover he has left them a beautiful surprise. First included as part of Tan’s Tales From Outer Suburbia, Eric is now presented as a standalone hard cover offering, suitable for all ages. With Tan’s delightfully simple illustrations – chiefly in grey-scale but with splashes of colour where needed – and accompanying minimalist text, this is an offering to be simultaneously laughed at and pondered.